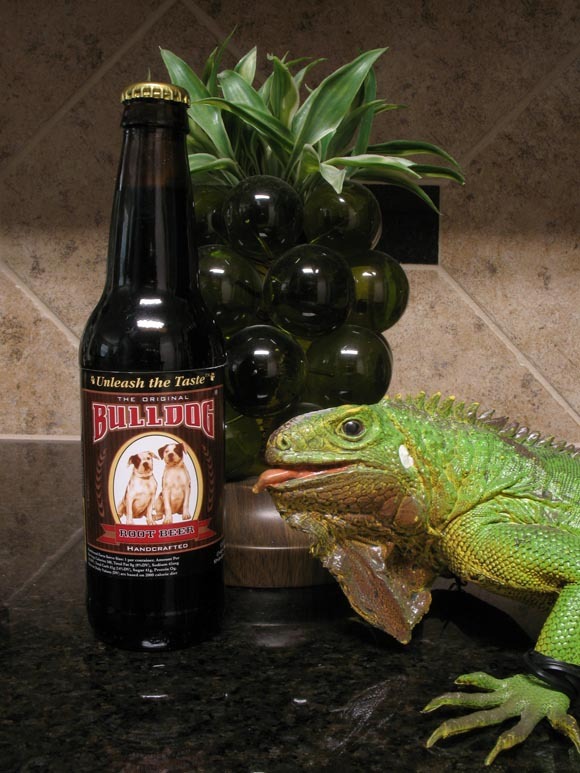 Bulldog Root Beer, Unleash the Taste! That’s what the bottle in front of me reads. When I think of unleashing something I think that I’m going to have such a hard time controlling it that I’m just gonna give up and take it off the leash. This “thing” that I’m unleashing is going to be powerful, brash, unstoppable, unforgettable, and even dangerous. I know that they’re probably making a dog pun in this situation but even if that were true they really need to “mean up” the dogs on the label. These two lovable, dopey (in a good way), looking dogs are just sitting there looking at me waiting for a good tummy rub. These puppies don’t need to be “unleashed” they need a chew toy and a nap. Anyway… enough of that. Bulldog Root Beer is of course a root beer and judging by the ingredients a pretty high quality one at that. It’s sweetened with a combination of cane sugar and honey but sadly also had sodium benzoate. I haven’t picked on sodium benzoate in a while so I thought I’d bring it back up. One thing I notice is that they use “real vanilla”. That’s how it’s listed on the label… “real vanilla”. Not once have I ever seen “fake vanilla”. I’ve seen “vanilla extract” which I what I assume they are separating themselves from by saying “real vanilla” but I found it rather silly to see. Anywho, it’s time to open up this paw laden bottle and see what we can dig up! Ha! I can make dog puns too. This has a rich creamy root beer smell. One determining factor of a delicious root beer is when you can actually smell that it’s creamy. That tells you it’ll probably go great with some Blue Bell Homemade Vanilla Ice Cream. If you don’t have Blue Bell in your area I’m so very sorry, you’ll have to manage on whatever “Ice Cream” you can get your hands on. Speaking of “on”… on to the tasting! Wow that is creamy… if I do say so the creamiest root beer I’ve ever experienced. Bulldog Root Beer almost has a cream soda finish to it. The carbonation isn’t really a factor when compared to the flavor and mouth feel. The mouth feel and aftertaste is so smooth it’s almost buttery. Now I know that buttery root beer sounds gross but I don’t mean that kind of butter. The after taste I’m getting here is very similar to that of butterscotch. I’m a big fan of butterscotch so this ranks very high with me. Fun fact: The only candy I’ve ever choked on was butterscotch. My grandfather held me upside down while my grandmother patted me on the back to dislodge it. The butterscotch must have realized my love of it while being dissolved by my saliva and in a selfless act to save its future brethren tried to murder me. Anywho… back to what remains of this review. A lot of times when a soda uses honey to sweeten it’s one of the main things you taste; this is not the case for Bull Dog Root Beer. I’m thinking the honey paired with the cane sugar is what’s cutting that honey flavor I so often find when sampling a Thomas Kemper or the like. Here is the part where I apologize for mocking “real vanilla”. That “real vanilla” is surely a large part of why I’m loving this so very much. It’s adding just the right amount of “smooth” to the flavor to set it apart from other root beers. It’s not hard to find subtle differences in root beer. They can be made so many different ways you’re not going to find one that immolates another just right. The real reward is when you find a root beer that has differences that could be spotted from space. Bulldog Root Beer is one of those root beers. As of today we’ve reviewed 30 root beers and I can’t think of one that gives you an experience like the one I have in front of me today. Who's a good iguana? Twist's a good iguana! Who want's a tummy rub? Twist wants a tummy rub!